When I first got into gaming, I brought every game I thought my family would enjoy out to Colorado. I became an expert at packing various sized games inside my carry-ons. I've made them play Fluxx, Settlers of Catan, King of Tokyo, Carcassonne, and a slew of small box games that they merely tolerated. 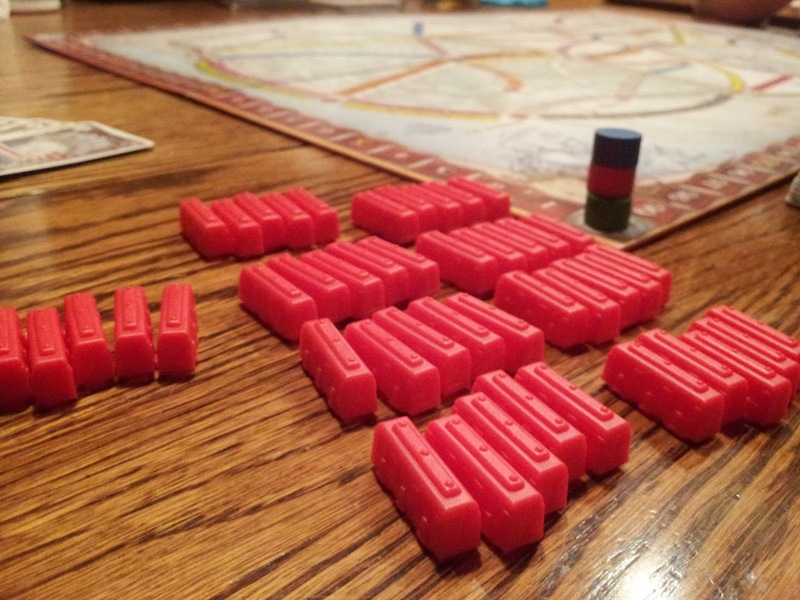 When my mom was recovering from her knee surgery and trapped on the couch, I made her play Ticket to Ride with me. After three games she had me downloading a digital copy of the game onto her iPad. On my next trip out we introduced it to my brother and sister-in-law and they both loved it. 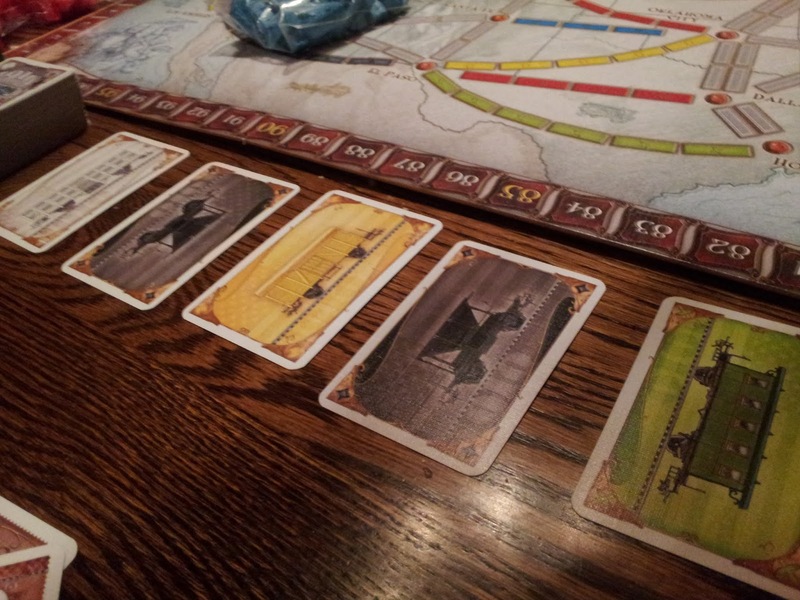 Ticket to Ride is an instant hit with almost every person I introduce it to. It takes 5 minutes to teach and one turn to completely understand. It's not uncommon for beginners to win their first or second games. I know my sister-in-law took to it like water. I have to keep buying expansions just to try and beat her. The game is colorful and the pieces are cute. The little plastic trains have wheels and embellishments molded into them that make the game feel real. As soon as the pieces are passed out people immediately start lining up their trains. It's not part of the game, people just want to do it. When just playing with the pieces is fun, you know it's going to be a good game. 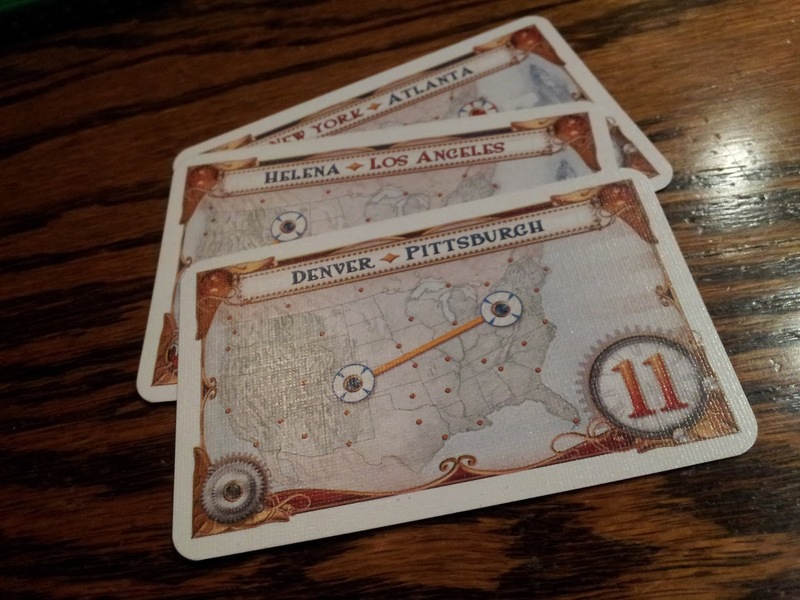 In Ticket to Ride the goal is to collect the most points before the game ends. You collect points by laying tracks and completing tickets. When you lay tracks during the game you earn points immediately. At the end of the game, you earn points for all the tickets you've completed from your hand. Any uncompleted tickets in your hand are worth negative points. The value of a ticket depends on which cities it routes to. You complete tickets by laying track that connects the two cities mentioned, by whichever route you desire. 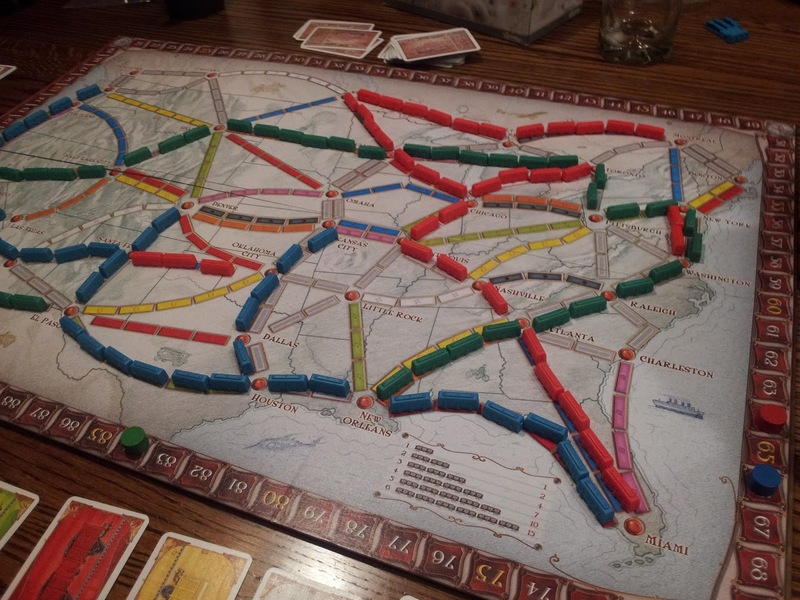 The final round of the game starts when one player has 2 of fewer trains left in their supply pile to play with. After that round the game is over and the player that has the most points due to either laying track or completing tickets is the winner. 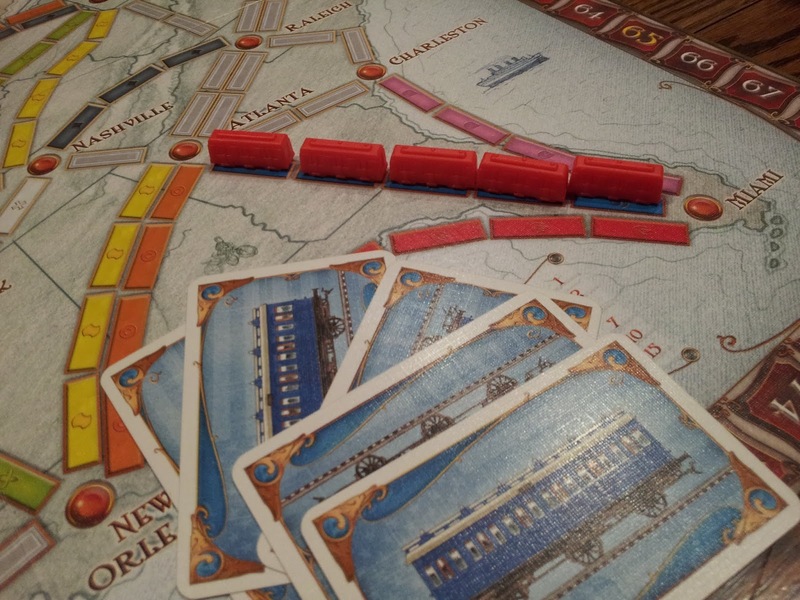 To lay track, you have to play the number of correctly colored train cards that match the piece of track you're trying to complete. You have to play the right amount of cards all at once, all of the right color. If the section of track you're aiming for is grey in color, you can use any color train cards you want, as long as you have the exact amount in all one color. Rainbow Locomotive cards can be used as Wild Cards, if needed, for however many cards you need to complete a section of track. When you draw cards you get to draw up to two from either the deck or the five face-up cards beside the deck. You can draw both from face-up cards, both from the deck, or one from each the face-up cards and the deck. The only exception to this rule is if you draw a Rainbow Locomotive from the face-up cards. If you draw a Rainbow Locomotive from the face-up cards, it is the only card you can take that turn. If you draw one from the deck, that is fine and you may still take a second card. At any point in the game you can decide to draw more tickets. You might want to do this if you complete your starting tickets early. To draw more tickets, you take the top three cards from the ticket deck and pick at least one to keep. You may keep all three if you want, but you have to keep at least one. Drawing more tickets can be a gamble that can either hurt or help a lot. 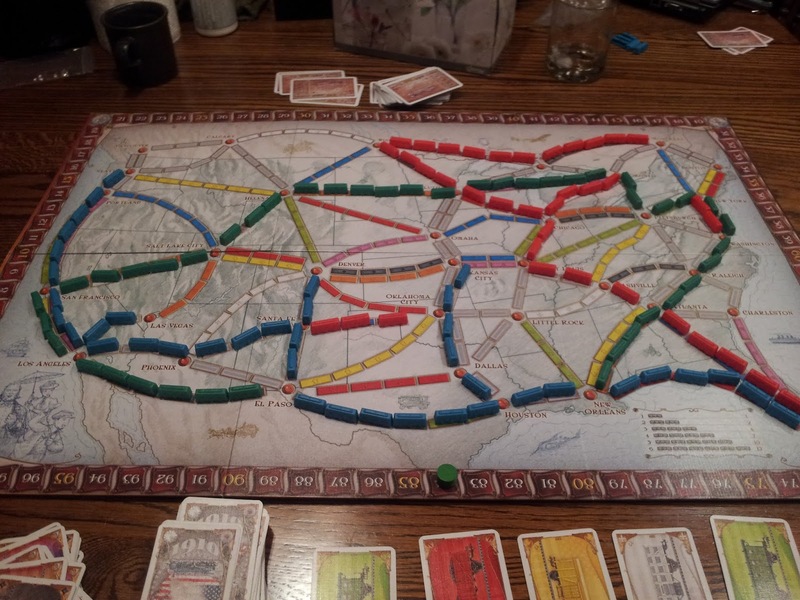 That's it, that's how you play Ticket to Ride. Simple, right? Yeah, until you're racing your mom to Seattle through the midwest and your brother decides to build the last section of track through Denver, completely blocking you, just to mess with you. If you'd like to see this game in action, or just watch Wil Wheton's wife "rage quit" at the end, check out this video from TableTop. Knit, Ski, Knit, Ski, Snit Kki?